Praise God! After nearly 4 years of suffering regularly from the pain of fibroid cysts, our precious and beautiful Eva can finally face life without the worry of that pain, and without the need to take strong, expensive pain killers on a daily basis. As a Kenyan it’s not an easy task to raise the funds necessary for such a surgery. But by the grace of God and generous people whose hearts He touched, money was made available for the operation. Eva spent 7 days in the hospital as they changed the date of surgery after being admitted, but finally they performed the surgery. I must say that after Eva awoke from surgery I learned the Swahili word for “pain”, as she was repeating “chungu, chungu.” I asked her brother-in-law if that meant “pain” and he said yes. Poor Eva. But eventually that pain subsided and now she is quickly on the mend. I think it must have helped also that her mum didn’t eat for 7 days until she had the surgery. Maybe because out of 14 children in her family there are 7 that remain. 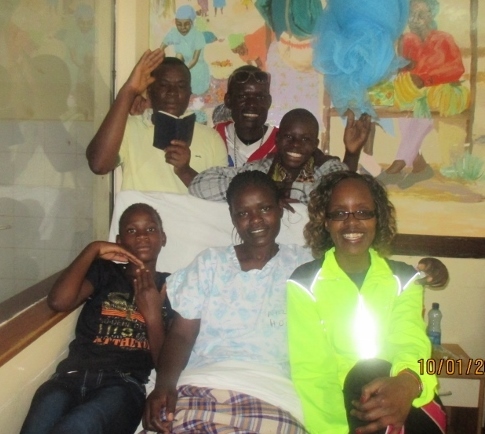 So we praise God and think you for your prayers and support that helped our friend here in Kenya, Eva, have a much needed surgery and be able to enjoy her life to a much fuller extent now. We know that God is fullness of everything good and desires us to live a life full of everything good that He has for us. Eva, the day after surgery.